We conclude our coverage of the 2016 JAPAN CUTS film festival with reviews of Yoshihiro Nakamura’s THE MAGNIFICENT NINE (2016) and Ryosuke Hashiguchi’s THREE STORIES OF LOVE (2015). You can read the rest of our coverage of JAPAN CUTS 2016 HERE. The first half of Yoshihiro Nakamura’s The Magnificent Nine greatly overshadows the second, though the second isn’t a complete wash. Based on a true story, the film documents the eponymous group of late eighteenth century businessmen from the small town of Yoshioka in Sendai who hit upon an ingenious solution for easing the outrageous tax burden placed upon them by their district governor. Their governor, a foolish twentysomething with eyes for political advancement, desperately needs money to finance bribes for Edo officials who could potentially recommend him for promotions. So the businessmen, led by local tea grower Tokuheiji Sugawaraya, decide to loan their governor the money and use his interest payments to revitalize their village. This, of course, could mean their automatic execution if discovered. The pleasure in The Magnificent Nine largely comes from watching a subgroup of characters usually ignored by jidaigeki: businessmen and merchants. Sugawaraya and his compatriots are the ones usually lurking in the background of samurai films, staying far away from anybody who might matter to the story. Here they are brought to the forefront, each given plenty of screen-time and development as Sugawaraya gathers them together like an ersatz Avengers initiative—my favorite one was Jyunai Endo, the money exchange shop owner who only joined because he thought it was a get-rich-quick scheme, left when he discovered it wasn’t, and rejoined after being guilt-tripped by a monk. Much as in Adam McKay’s The Big Short (2015), Nakamura interrupts his film with delicious fourth wall breaks which contextualize their scheme and dumbs it down to layman’s terms. In this way we learn the odds and ends of Yoshioka’s financial exploitation, the conversion of Tokugawa era coinage to modern-day yen, and even little details such as how around 50% of commoners in that time were illiterate. But the second half of the film shifts focus away from the ploy to the businessmen themselves. Once there, Nakamura falls victim to rote melodramatic flourishes. 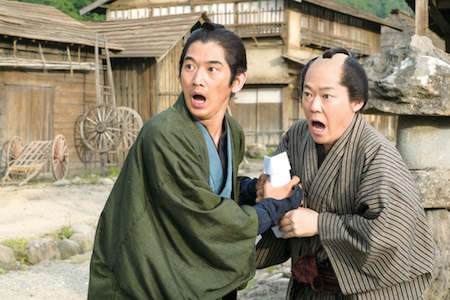 In particular, the film redirects its focus on the tumultuous relationship between Jyuzaburo Kokudaya and Jinnai Asanoya, the estranged sons of the town’s old money-lender. They dominate the last half, shoving all the other characters and the plot to the side. In fairness, Nakamura handles the melodrama well, earning all the emotional payoffs fair and square. But whereas in the first half of the film we viewers were colluders, in the second we are mere bystanders. It’s a significant downgrade which keeps a good film from being great. Before I discuss the film itself, I want to take a moment and commend the three actors who play the leads in Ryosuke Hashiguchi’s Three Stories of Love (2015). All three were mostly unknown actors selected by Hashiguchi during a workshop. Following their auditions, he tailor-made each of their roles to match their personalities. Each gives solid performances worthy of recognition. Sadly, they are trapped within a largely blasé film. It interweaves three stories of loss and love with only middling success. The first, and most prominent, involves Atsushi (Atsushi Shinohara), a bridge inspector with an almost supernatural ability to detect internal damage within structures by gently tapping on them. Three years ago his wife was murdered in a random street attack. Drowning in grief, Atsushi struggles to feed himself and afford basic healthcare. The second character is Toko (Toko Narushima), a desperately unhappy middle-aged woman trapped in a loveless, emotionally barren, and sexually unfulfilling marriage. During the day she works a miserable job in a bento factory. At night she escapes by drawing manga about princesses. The third is Shinomiya (Ryo Ikeda), a homosexual lawyer who just can’t seem to get his personal life in order. If my description of Shinomiya seems lacking compared to the other two, it’s because I had trouble drawing a bead on him. Other than a scene where he breaks his leg, I remember almost nothing about him despite writing this review mere hours after watching the film. He may be one of the protagonists, but he has so little screen-time that I kept forgetting he was part of the film. I find this odd since Hashiguchi came to prominence as one of Japan’s first directors to openly address homosexuality with films like A Touch of Fever (1993) and Hush! (2001). Instead, I found Toko’s story to be the most compelling. 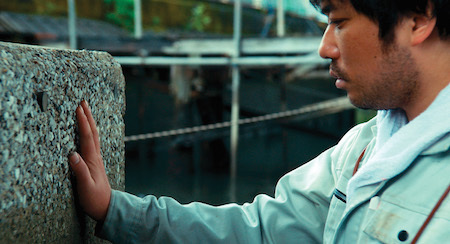 Certainly Narushima gives the best performance in the film, embodying the silent despair of despondent heartbreak more successfully than even Shinohara, a character afforded a melodramatic confession to the spirit of his dead wife that seems custom-made for an Oscar nomination clip. Hashiguchi tries to connect the three stories by having the characters cross paths with each other, such as Atsushi trying to hire Shinomiya to sue his wife’s killer. But these overtures at a hyperlink continuity reminiscent of Robert Altman or early Alejandro González Iñárritu, fall flat. The three stories are poorly balanced and only serve to interrupt each other.